I used to copy and paste interesting quotes or whole articles into documents I stored locally. I would reread these documents often, and quotes would eventually make their way into my own writing. An article I had stored in June might provide inspiration the following March. This was before I had a Twitter account, or a smart phone, or a concept of what “social media” was. Now when I read something I like on the internet, l tweet the link, hopefully with a quote I found particularly thought-provoking, but too often, with just the headline. Off it goes in the hope that one of my Twitter followers or Facebook friends will enjoy it. After all, “sharing is caring”. But what’s in it for me? A month later, finding that article again means scrolling through my own tweets, which looks super-self-obsessed, even by my standards, and which is pointless unless I already know what I’m looking for. And if I do, I might as well just google it. Meanwhile, I can’t remember the exact reason I shared it: What did it make me think about? Something clearly made we want to react to it. or process it in some way. But I haven’t processed, only “shared”. If I continue down this lazy, sharing-just-because-there’s-a-share-button path, I’ll find myself Facebook-liking articles via one of those handy icons at the top of the page without even reading it, just because the share-buttons got to me before the complete sentences did. I’ve made a decision: I want to use social media the way I did before social media was something you could do for a living. I don’t mind if my online presence is more personal than social. I want to go back to the weblog – my collection of what I’ve read and heard and thought about. If someone else likes it, great! If not, at least I have my digital archive (I’m a digital word hoarder. We’ve already established that). My digital introversion is not (just) me getting old and longing nostalgically for a bygone pre-Instagram era. Last month, Dylan Tweeney wrote for VentureBeat that blogging is making a come-back, now with better integration with social networks, as a way for people to take back control of their online lives. Sites like Facebook, Twitter and Instagram are great tools, but they control what you upload more than you control their user policies. My blog is on WordPress at the moment. But I can transfer my whole blog from WordPress to a competing blog platform or back to a personal domain. In fact According to Julie recently moved from a personal domain edited with Movable Type, to WordPress. It was my dad’s personal domain, and I needed his help in the moving process, but I trust and influence my dad way more than I trust and influence Facebook or Twitter. In this space, I decide not just what I publish, but what I do with it later. Seven and a half years after I started According to Julie, I can easily find my first blog post. I can’t say the same for my first tweet or my first Facebook status. 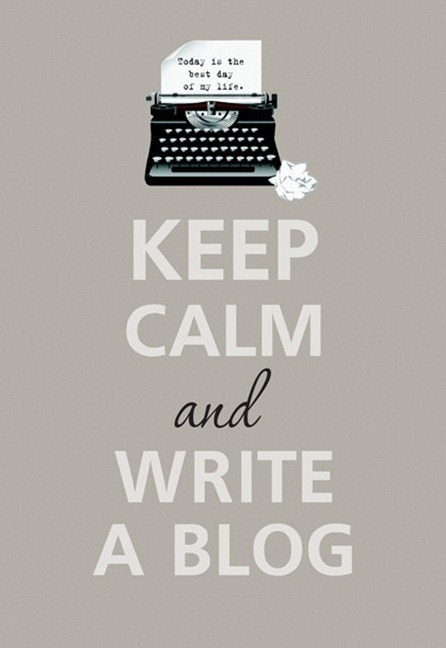 A return to blogging as the center of your digital presence could also mean more frequent, short posts of course. Eirik Newth (one of the first bloggers I read regularly) noted the lack of short posts in his blog as he turned to Twitter whenever he wanted to give his readers a look-what-I-found-on-the-internet tip. I wanted to blog about that, but I tweeted about it, proving his point. That was back in 2010, when I searched for my favorite Norwegian bloggers and found that most of them had stopped blogging and started tweeting. That was the year I got an e-mail about my RSS service Bloglines shutting down, felt wistful for a while, then realized I was spending all my time on Twitter anyway. When Bloglines reopened shortly after, I wasn’t paying attention to it anymore. But all my feeds are still there, and on Google Reader, where I moved them (easily), just in case, back then. I don’t agree that my attention span is permanently damaged by 140 characters and constant updates. But as I’ve been heading back into this paragraph-based world delivered by RSS feeds over the past couple of weeks, I feel more relaxed. It’s easier to think of what my own response to what I read should be, beyond a retweet. Not that I don’t want you to retweet this obviously. Just think about it too. And speaking of RSS feeds, you should also read this “Remembering Aaron Schwartz”. Categories: IT and the Internet according to Julie, Journalism according to Julie, Julie in English | Permalink. Oh, I’m thinking about it. Like you, I’ve increasling seen myself go from tweeting and G+ing (I left Facebook some time ago) everything, back to blogging more myself. I have also rediscovered the joys of a properly curated RSS feed, and thanks to tablet apps like FlipBoard and Feedly it’s easier than ever to keep up with the web in a relaxed manner. And yet you link back to your Twitter account, not your blog…?